Posted on Thu, Mar 15, 2012 : 12:44 p.m.
After years of negotiations, members of the Sigma Phi Epsilon fraternity plan to move into their new home this fall: the former Memorial Christian Church near the University of Michigan campus. The 15,560-square-foot building -- which was listed for sale for $1.8 million this summer -- is located on the corner of Tappan and Hill streets. Members of the Sigma Phi Epsilon plan to move into the former Memorial Christian Church this fall. After finalizing the purchase of the building earlier this year, renovations began in January to convert offices into bedrooms, study space, and a social and dining area for 44 members to move into the house, the Michigan Daily reports. 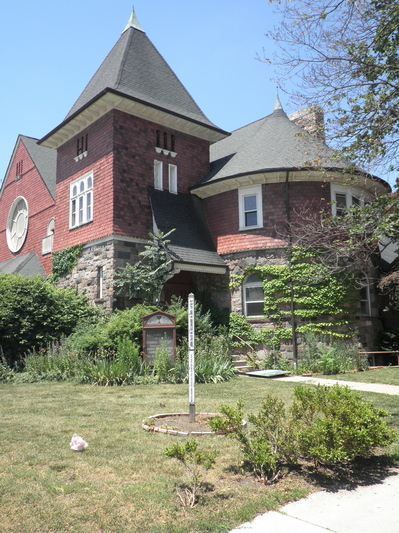 The Ann Arbor Planning Commission approved a special exception use to allow Sig Ep to convert the church into a fraternity house in March 2011, but the property was put on the open market last summer when the deal temporarily fell through. Now that the deal is finalized, the fraternity estimated the cost of the renovation project will total more than $3 million, according to the report. Sig Ep received more than $700,000 in pledges from alumni to help finance. Ypsilanti-based Phoenix Contractors and Ann Arbor-based Hobbs + Black Architects -- which was founded by a Sig Ep alum -- are working on the project. The building will not undergo any external changes as part of the renovation. Members of Sig Ep currently live in a former apartment complex on Hill Street near State Street that they transformed into a fraternity house. The Memorial Christian Church -- which moved into the Tappan house in 1923 -- relocated to a temporary space in Pittsfield Township at the end of July to get away from the student housing area. A representative from the church told AnnArbor.com they plan to purchase a building in the Pittsfield Township area for a permanent church location. Read the full Michigan Daily report here. Good luck with your new residence Brothers! HFF! Thu, Mar 15, 2012 : 8:36 p.m.
Thu, Mar 15, 2012 : 9:04 p.m.
Thu, Mar 15, 2012 : 8:47 p.m.
Thu, Mar 15, 2012 : 8:34 p.m.
Good Luck, and hope the frat takes care of this house, and it's inheritance. Thu, Mar 15, 2012 : 8:20 p.m.
Hopefully the frat doesn't turn this house upside down on the inside. They re-built their house on the corner there and then still trashed it, ahead of it closing/burning. Oy. Thu, Mar 15, 2012 : 7:25 p.m.
Beautiful building for a fraternity house. I hope the members treat it with respect. There have been a few fraternities on campus that have absolutely trashed their houses in recent years. Thu, Mar 15, 2012 : 6:22 p.m. Didn't Sig Eps' house used to be on the corner of State and Hill and it burned down about 20 years ago? I remember that day...it was a day much like today...sunny....warm....but there was black smoke pouring out of that big ol' house. Thu, Mar 15, 2012 : 6:26 p.m.
Thu, Mar 15, 2012 : 6:24 p.m.
Thu, Mar 15, 2012 : 5:52 p.m. I am glad it worked out. Fantastic Location. Very wise move. Good Luck.